BAZAAR CHIC IS BACK! 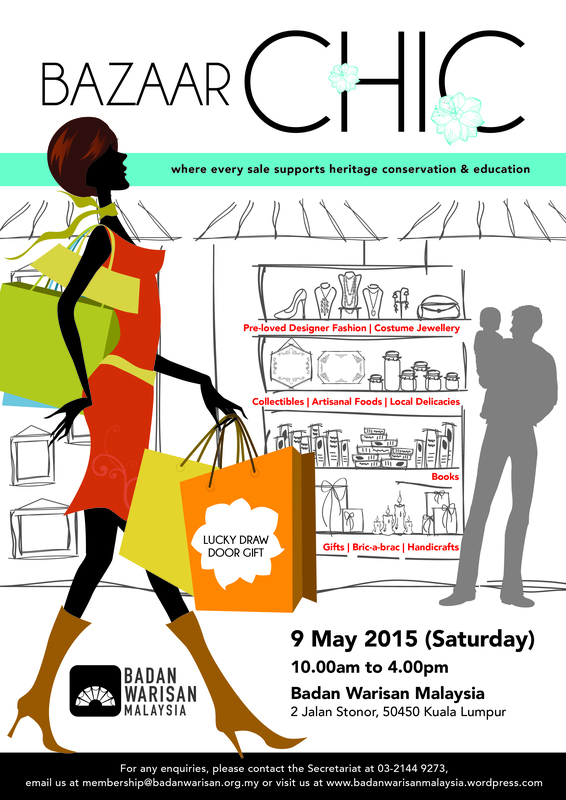 Since the inaugural event in 2008, members and friends of Badan Warisan Malaysia (BWM) hold “Bazaar Chic” once every 2 years to raise funds for the organisation. This year, in addition to the stalls and vendors, the event will be hosting a ‘Brocante Room’- a special section selling new and used high-end collectibles. Some of these heirlooms include crystal ware, china, objets d’art and home furnishings. Items for sale: PRE-LOVED GOODS – Designer hangbags, shoes, scarves & costume jewelry. ARTS and ORNAMENTS – a fascinating array of objets d’art and art works – great bargains to be had ARTISANS AND HANDICRAFTS STALLS – unique, handmade items and a jumble section of clothes, shoes and accessories, books and handicrafts FOOD – delectable selection of local delicacies, family favourites and gourmet foods! DOOR GIFT – make a small donation and get a chance to own the latest iPhone 6, vouchers for a 2-night stay at Cheong Fatt Sze Mansion, Mont Blanc pen, luxury toiletries basket, restaurant meal vouchers, and much more!! Few more spaces left in the Stall Holders’ Marquee which will be set up in the grounds of 2, Jalan Stonor for the Bazaar. If you have unique handmade items for sale you may wish to take up a stall allotment. Stall holders are provided with: 1 x table with table cloth, 2 x chairs, bottled water and a power point-all for a donation of RM300. The takings will be yours. Contact the Secretariat T: +603-2144 9273 E: membership@badanwarisan.org.my REMINDER——-Applications close on 14 March. This Bazaar Chic will feature a “sale on commission” of vintage, antique and good quality items in our designated Brocante Room. Put aside art works or ornaments for which you would like some return. We will agree a price and BWM will take a percentage of any sale. Register your interest with the Secretariat (Miss Jee on 03-2144 9273) and arrange for a member of the Selection Committee to view your items. A copy of the Consignment Agreement Form will be sent to you on request. All submissions will be confidentional. EXCLUSIVE LUCKY DOOR PRIZES AVAILABLE!! CHECK OUT WHATS IN STORE AT BAZAAR CHIC 2015! This entry was posted in News & Events and tagged 2 Jalan Stonor, badan-warisan-malaysia, Bazaar Chic, bazaar chic 2015. New & Exciting Things are Happening at Badan Warisan Malaysia! But on this WordPress post, the closing date for stall applications is 14th May.